~* West End Designs Journal *~: The Longest Day! the cooking, not a crafty thing was done. And all I have to show for it is a headache to end all headaches. 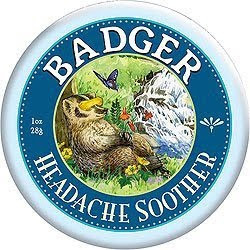 I am going to crawl into bed and rub some Badger Balm Headache Soother on and see if I can sleep. I swiped this photo but I got the actual product at Whole Foods. It is wonderful. I promise......recipes and knitting and a bunch of other stuff are coming......one of these days....... And thanks for still reading my little blog!! !